Sir Thomas Malory. Le Morte DArthur. J. M. Dent & Co: London, 1893-4. On Tuesday 26th July 2016, Dr Samantha Rayner (UCL) and I visited a place of wonder: a book storage unit. Tucked away on an industrial estate in North Wales, this enormous warehouse is home to thousands of titles belonging to Bangor University – books that, for a variety of reasons are no longer held in the main university library – whether due to changing syllabi, modernised editions replacing older ones, or shifting fashions for certain areas of study. The books that have been removed to this unit represent a very real issue for libraries with regard to storing materials that make way for more current titles and collections, but they also make for a veritable treasure trove of almost forgotten material for bibliophiles – as we were to discover. Browsing through the shelves – all of which contain uncatalogued materials – Dr Rayner and I discovered some gems, the brightest of which was a beautiful edition of Sir Thomas Malory’s Le Morte D’Arthur – illustrated by Aubrey Beardsley (b. 1872, d. 1898), published between 1893-4. This is an iconic work for Arthurian, Victorian, publishing, and art historian scholars alike. According to the art critic Haldane Macfall, a fortuitous encounter in a Cheapside bookshop between would-be artist Aubrey Beardsley (b. 1872, d. 1898) and publisher John M. Dent resulted in this work – one of the most sumptuous and iconic editions of Sir Thomas Malory’s Le Morte D’Arthur of the Victorian Arthurian Revival, and indeed of modern times. Beardsley, who worked as an insurance clerk in London, frequented the nearby Jones and Evans’ bookshop on Queen Street. He befriended one of the owners, Frederick Evans, to whom he would show his drawings. In 1892 the publisher Dent was also in the bookshop, and told Evans about his search for an innovative artist to illustrate a new publishing venture. 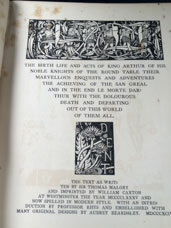 Dent had decided to produce an edition of Malory’s Arthurian masterpiece, the Le Morte D’Arthur, in his aim of publishing beautiful yet affordable classics to rival the expensive editions produced by William Morris’ Kelmscott Press. The story goes that Dent was telling Frederick Evans about this when Beardsley happened to enter the bookshop. “There’s your man!” said Evans. stripped the heroes of their strength and nobility, presenting them reclining, sleeping, or dominated by women. The book was published with a limited print run of 1,800 copies – with 300 printed on Dutch handmade paper, and 1,500 ordinary copies – the copy we found is one of the latter. This was Beardsley’s first commissioned work as an artist. It allowed him to leave his insurance role to pursue his artistic talents, and he went on to become an important figure in the Art Nouveau movement. He died of tuberculosis in 1898, just four years after completing the illustrations for Dent’s Le Morte D’Arthur, which is still one of the most iconic and recognisable Arthurian editions of the modern period. Update: the Centre for Arthurian Studies and Special Collections at Bangor University Library and Archives are currently working together to raise awareness of the rich and sometimes untapped resources in this location, as well as repair damaged books, such as the Beardsley Malory discussed above. Haldane Macfall. Aubrey Beardsley: The Man and His Work. John Lane and the Bodley Head Limited: London, 1928. See also The Arthurian Handbook, 2nd ed. Eds Norris J. Lacy, Geoffrey Ashe, Debra N. Mancoff (Routledge: New York and Abingdon, 2013), pp. 240-243.